Free Shipping Included! 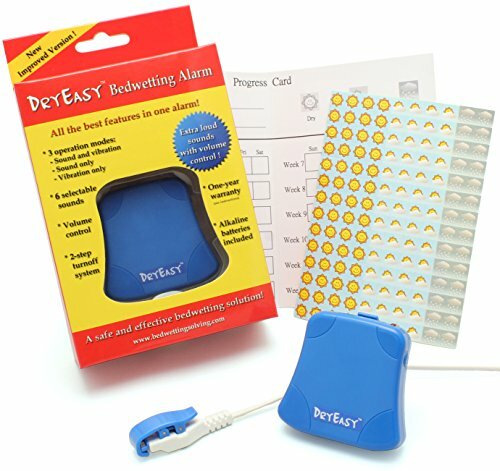 DryEasy Bedwetting Alarm with Volume Control, 6 Selectable Sounds and Vibration by DryEasy at Kids Grooming. MPN: DE100TS. Hurry! Limited time offer. Offer valid only while supplies last. DryEasy bedwetting alarm is a comprehensive product. It is equipped with all the indispensable features an effective bedwetting alarm should have. DryEasy bedwetting alarm is a comprehensive product. It is equipped with all the indispensable features an effective bedwetting alarm should have. Its alarm sounds are specially selected for waking deep sleepers up. To suit users' preference and prevent them from getting used to a particular sound, 6 different sounds (with a choice of playing a single sound or 6 sounds at random) are available for selection. DryEasy bedwetting alarm also provides 4 levels of digital volume control to cater to different needs. The pre-set operation mode of "sound plus vibration" can be changed to "sound only" or "vibration only" easily. With the adoption of a 2-step turnoff mechanism, it's unlikely that users would fall asleep again after having turned off the alarm. Sensor is the most critical component of a bedwetting alarm. ToggleSmart is our newly-developed sensor. It is designed to fix all the major deficiencies of the sensors available on the market. By applying the toggle clamp technique, ToggleSmart can be securely attached to underpants in an easy way. This sensor is extremely reliable, for it triggers the alarm rapidly every time as soon as bedwetting occurs. With the open-cover design, cleaning and drying of sensor becomes much easier. The manufacturer of DryEasy alarm is an ISO9001:2008 certified factory and has acquired ISO 13485, a certification of quality management system for design and manufacture of medical devices. The features of DryEasy alarm are well designed in the sense that it is functional and user-friendly. We believe this alarm is the most versatile one that you can find on the market today. If you have any questions about this product by DryEasy, contact us by completing and submitting the form below. If you are looking for a specif part number, please include it with your message. GoodNites TRU-FIT Disposable Absorbent Inserts for Boys & Girls, Refill Pack, Size Small/Medium, 18 ct.